I've been hanging around here for a while now eaves dropping on various topics, and decided its about time I posted up my layout. 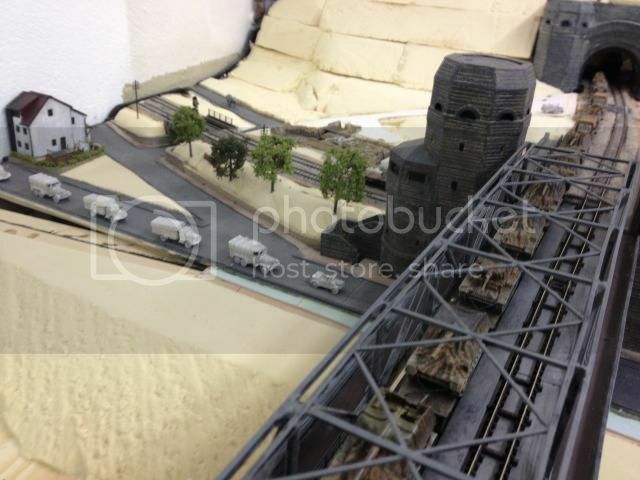 The centre point of the layout is the Ludendorff Bridge that used to span the Rhine and made famous by being the first bridge over the Rhine captured by the Allied in 1945. My layout is set a bit earlier in the autumn of 1944 as the bridge defences were being built up in preparation of the Allied advance. I've been building the layout for about a year, although it's existed in concept for several years longer. 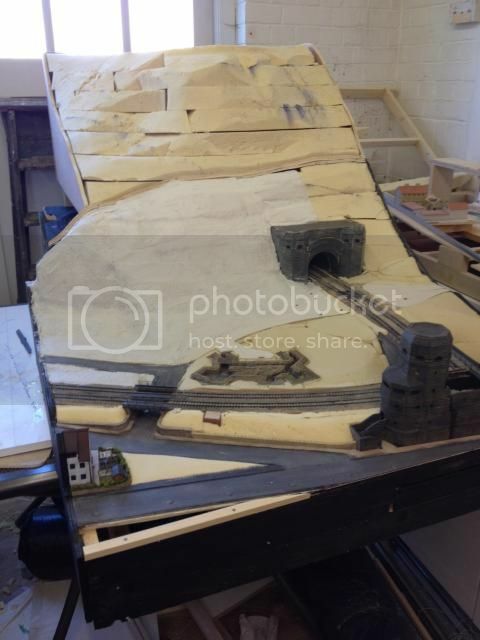 So far progress has been painfully slow with most of the work concentrating on the bridge and the scenic board for the east bank where the line disappears under the Erpeler Ley mountain. Progress on the west bank has started, but is being held up by progress getting the bridge abutment completed before any track can be laid. These are a few photos of progress so far that I hope will give an of progress so far. The Erpeler Ley part covered in Modroc. The view from the top of the Erpeler Ley down at the east back defence trenches. Another view of the east back showing a army convoy heading south towards Koblenz. The west bank abutment still awaiting cladding and the part built farm house in the foreground. I'll post up more pics later. Wow, that really is very good! Superb work Al and welcome to the forum, this is going to be one thread that I follow. This is looking very impressive so far, I look forward to watchin your model develop. Excellent layout so far! I spent a wonderful few days railfanning in Remagen a few years ago, the bridge was very impressive. Can't wait to see more! 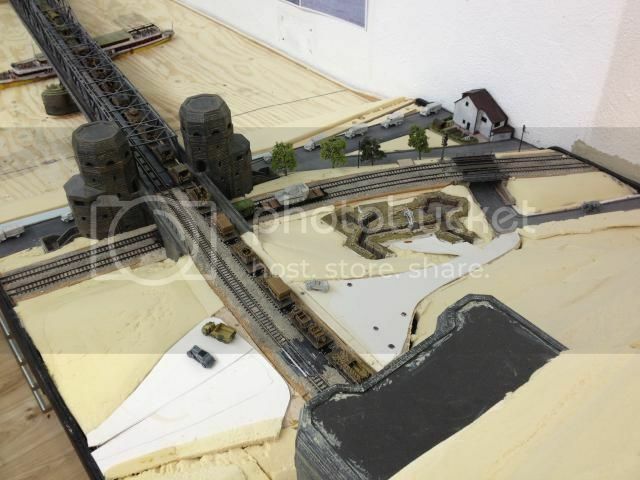 Looks really impressive, Al, how big is the layout going to be? Very impressed with it so far and welcome to the forum. Please keep the coming. Rally excellent scenic modelling. Looks just like the real thing. i remember looking out for the bridge many years ago when travelling around West Germany by train. these links may be of interest - someone has beaten you to it! 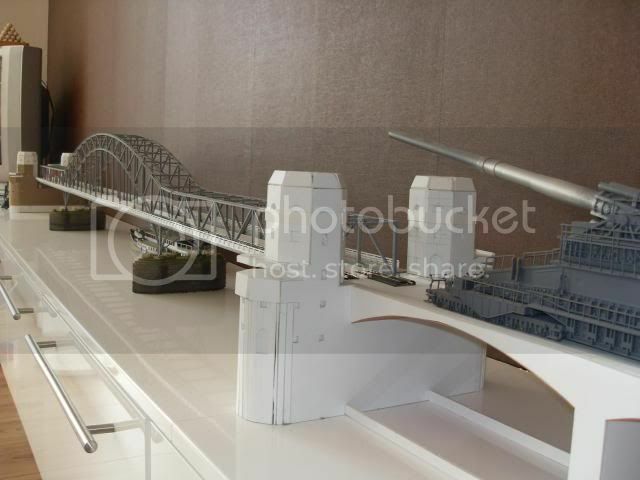 ive also seen a model of the Bridge - however can't remember if it was in UK or Europe! Any leads welcome. 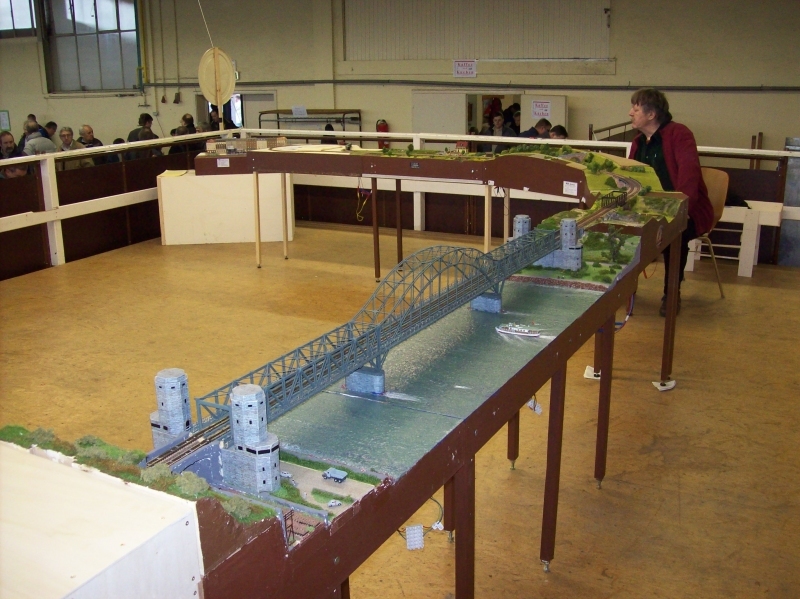 I'm aware of two other models of the bridge. 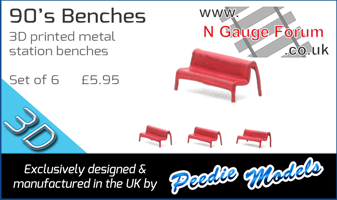 First is the one on ebay, and the second is part of a large German modular layout. Both impressive in there own rights. My layout is 8.5 metres long and covers the bit on line from Erpeler Ley, over the Rhine to the junction with the Remagen line near Sinzig. 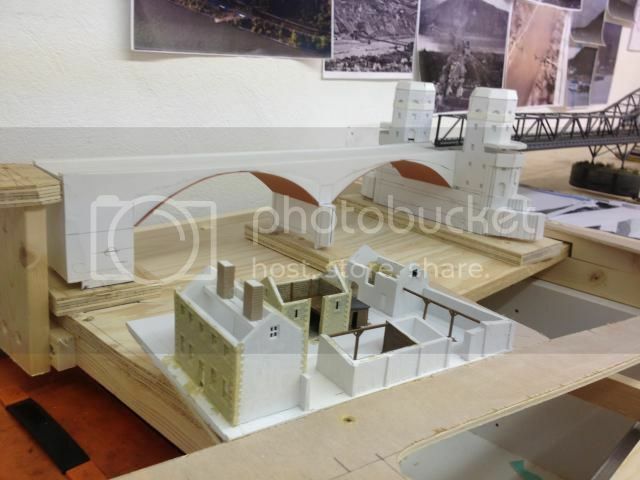 The centre piece is the bridge itself which measures 2 metres between abutments with Rhine in full flow beneath - or it will be once I get that far. 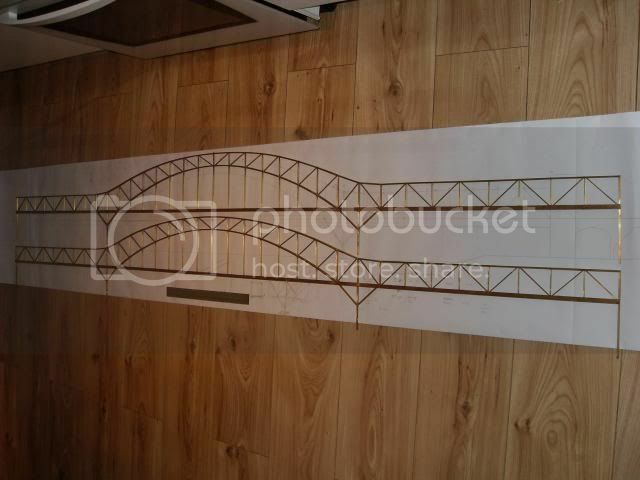 These are a few construction photos of the bridge build. Completed side frames before assembly. Frames assembled with cross members and work started on the abutments. 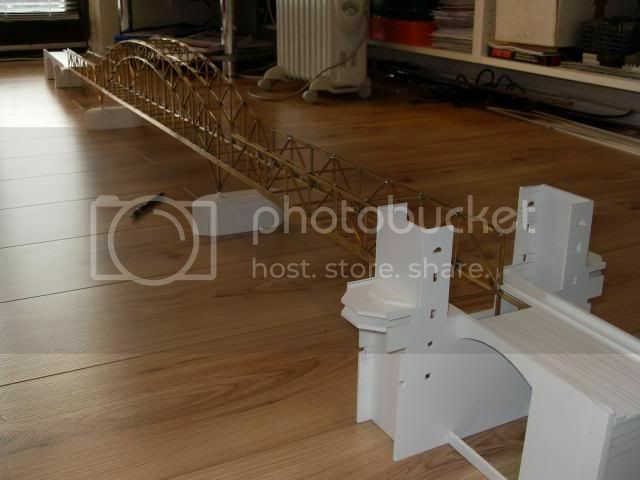 Another shot of the assembled bridge, this time with walkways and handrails fitted. i think its the German Modular version that i have seen - perhaps at NGS?? i will be interested to see Dora making a stately procession across the bridge when it is finished! please keep the pictures coming!! This is the modular one. I's been around fro a couple of years. There's a video of I somewhere too.